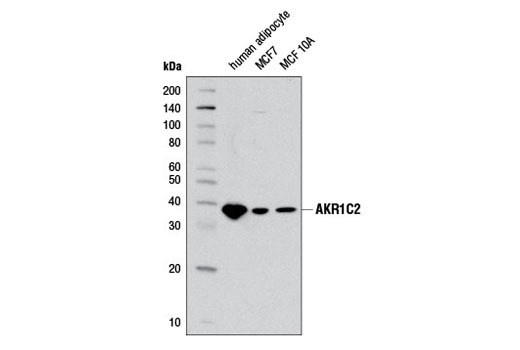 Western blot analysis of extracts from MCF7 and MCF 10A cell lines and human adipocytes using AKR1C2 Antibody. 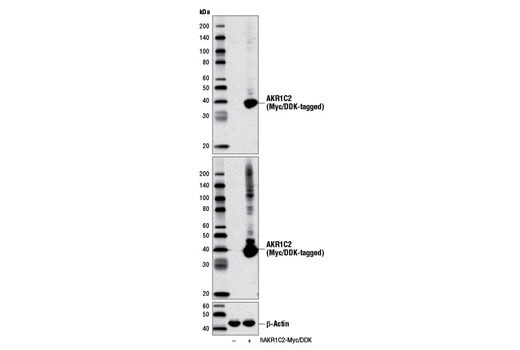 Western blot analysis of extracts from 293 cells, mock transfected (-) or transfected with a construct expressing Myc/DDK-tagged full-length human AKR1C2 (hAKR1C2-Myc/DDK; +), using AKR1C2 Antibody (upper), DYKDDDDK Tag (9A3) Mouse mAb #8146 (middle), or β-Actin (D6A8) Rabbit mAb #8457 (lower). AKR1C2 Antibody recognizes endogenous levels of total AKR1C2 protein. Polyclonal antibodies are produced by immunizing animals with a synthetic peptide corresponding to residues surrounding Val61 of human AKR1C2 protein. Antibodies are purified by protein A and peptide affinity chromatography. Aldo-keto reductase family 1 member C2 (AKR1C2) is a member of a large superfamily of aldo-keto reductases that metabolize an array of substrates in a NADPH-dependent manner. AKR1C2 is the 3-α-hydroxysteroid dehydrogenase (3α-HSD) responsible for metabolizing and inactivating the androgen hormone 5α-dihydrotestosterone (DHT) to 3α-androstanediol (1). Research studies demonstrate an increase in AKR1C2 expression in cases of advanced prostate cancer (2). Both AKR1C2 and the related reductase, AKR1C3, are implicated in enhancing PI3K/Akt signaling in prostate cancer by reducing prostaglandin D2 to the more stable 9α, 11β-PGF2α (2). In addition, research studies demonstrate an increase in AKR1C2 expression in some ovarian endometriosis specimens, suggesting the participation of AKR1C2 in the promotion of progesterone metabolism in ovarian endometriosis (3). Rizner, T.L. et al. (2003) Chem Biol Interact 143-144, 401-9. Wang, S. et al. (2008) Mol Cell Endocrinol 289, 60-6. Hevir, N. et al. (2011) Chem Biol Interact 191, 217-26.